Group tours for schools and student organizations are available year-round. Regular tours include the mansion, gift shop, outbuildings, replica Murrell Mercantile store (in season), and grounds. The museum also hosts an annual living history education day for students on the first Friday in May. To schedule a tour or for more information, contact Jennifer Frazee at 918-456-2751 or email jfrazee@okhistory.org. Download our free teacher’s curriculum and activity guide for your students. You are welcome to photocopy the activity pages to familiarize your students with the Hunter’s Home before their visit. If you are a teacher and would like to be added to our email list for programs please sign up online. Brownies (grades 2–3) Complete four activities. Take a tour of Hunter’s Home. After the tour, draw a picture of your favorite piece of furniture from the house. Visit George Murrell’s general store. What were the most popular items in the store? Do people still buy them today? Walk around the on the Hunter’s Home grounds. Pick up any trash you see to help keep the site in good condition for others to enjoy. 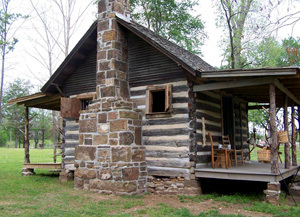 Find out the purpose of the smokehouse and springhouse. A plantation is a large farm. Both people and animals worked on the farm. Visit the chicken coops to learn about farming and what crops were harvested. Juniors (grades 4–5) Complete six activities, including the one starred activity. * Take a tour of the Hunter’s Home. Name at least three ways in which people’s daily lives in the 1800s were different than your daily life. Learn about clothing that women wore in the 1800s. Using original photos as an inspiration, design a dress that you would have liked to wear during that era. Pressed flowers were a popular keepsake for girls in the nineteenth century. Learn how to press and dry your own flowers. Write a letter to a friend and include a pressed flower for her, or make a scrapbook of different flowers you find when traveling. Visit the chicken coops on the grounds of the Hunter’s Home. What role did animals play on the plantation? What housing and supplies are needed to take care of them? Find a way to help preserve a local historic site for future generations to enjoy. You could pick up trash, clean out flower beds, paint fences, or help with a public event. Make sure to get permission from museum staff first. At home or on a camping trip, prepare a nineteenth-century recipe using a Dutch oven or using another traditional method of cooking. (Hint: With an adult’s help, download the teacher’s guide at www.okhistory.org/huntershome to find some sample recipes.) Share your creation with friends or family. Cadettes, Seniors, and Ambassadors (Grade 6 and up) Complete seven of the ten activities, including the one starred activity. * Take a tour of Hunter’s Home. Find out about the Cherokee Trail of Tears and how the Murrell and Ross families came to be located in northeast Oklahoma. How did the American Civil War affect the Cherokee Nation? Learn how to handle and care for fragile artifacts. What special treatment is needed to preserve old furniture, photographs, or other items? What is the best way to clean them? How should they be stored? Find out about three different career opportunities in the history or museum fields (historical interpreter, archaeologist, curator, program director, etc.). Ask someone in the field about their job, including required education, qualifications, and training. With permission from employees, plan a service project at an important historic site. Look for a need, come up with a solution, and volunteer your time to carry out the project. You could do yard work or gardening, help at a special event, or clean the inside of a historic building. George Murrell’s general store was an important part of the Park Hill community. What forms of currency or payment were used to buy goods in the store? What items were premanufactured, and which items had to be made by hand? Identify at least three plants or trees found on the grounds of the Hunter’s Home that were used for practical purposes other than food (such as medicines, dyes, etc.) in the 1800s. How did people cook and store food before refrigeration? Visit the Hunter’s Home kitchen, smokehouse, and springhouse to learn how food was prepared in the nineteenth century. Try your hand at historic techniques for producing clothing. 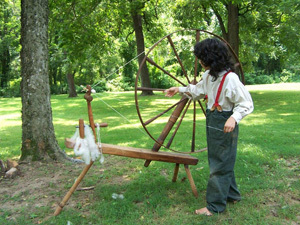 Hunter’s Home staff can teach you how to spin yarn, make felt, or weave yarn into clothing. You can also search for fiber arts techniques on YouTube. Go for a hike on the Hunter’s Home grounds. Write a poem or short story, or create a work of art or song that expresses your feelings about the area and its history. Share your project with friends. Create a promotional piece (brochure, poster, PowerPoint presentation, etc.) that markets the value of history to your local community. Share your project through a display at a public venue, such as your school or local library.